Amy and Elder have finally found a way to land on Centauri-Earth. With half of the population of Godspeed, they launch the shuttle and manage to crash land on the surface with hopes of building a new life on the planet. What they didn’t expect was that there would already be life forms inhabiting the planet, along with monsters in the form of pterodactyl-birds. They realize that in order to make a new life on the planet, they will have to find a way to cooperate with the frozens from Earth and fight to keep their new home. The end to this fantastic series was definitely bittersweet! Across the Universe blew me away when I first read it back in 2011 and the second book in the trilogy, A Million Suns, was even better! Beth Revis is a master at world building, and what is incredible is that she not only built an entire world on Godspeed, but in Shades of Earth she builds another fantastic world on Centauri-Earth. The descriptions of the planet were so brilliant that I could vividly picture it while reading. Revis builds an incredible world of toxin releasing plants, glass that captures solar energy, and dinosaur-like birds that eat people alive. While the planet presents many problems, one of the biggest obstacles to overcome is the conflict that begins when Amy unfreezes the people from Sol-Earth. The struggle for power between Amy’s father and Elder was very realistic. I would’ve been disappointed if the frozens woke up and suddenly everything was fine. It made much more sense for Amy’s father to try to take over as the leader of the people from Godspeed, and I was glad that Elder did not allow himself to be pushed away just because of his age. Amy annoyed me for awhile because at first she was completely insensitive to Elder and the way he was being treated by her father. She seemed to ignore the situation because she was so happy to see her parents, but poor Elder was left trying to stand up to her father on his own. I liked the way their relationship progressed in this book though, so even though she annoyed me I think this conflict between Amy and Elder was necessary to push them in the direction they ended up heading in. I loved the character development in this book. In each book of the trilogy there has been incredible growth in both Amy and Elder, but in this book especially I was impressed by how much they grew from beginning to end. Amy learned how to cope with loss and that her parents were not necessarily perfect people. I feel like she really grew up and was able to become more of a leader than a follower. Elder remained loyal to his people and grew up immensely, becoming the leader we all knew he was capable of becoming. He learned to have faith in himself and how to stand up to oppression. Overall, Shades of Earth was an incredible end to the trilogy and made me experience a rollercoaster of emotions from beginning to end. I’m sad to see it come to an end but I couldn’t have pictured a more perfect way to end the series! 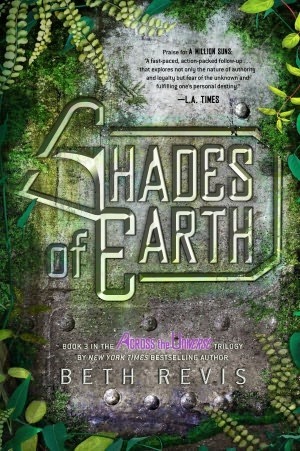 Shades of Earth was released on January 15, 2013 and is the final book in the Across the Universe trilogy. I completely agree and loved your review. I thought the ending was perfect. Did you fall for those blank pages towards the end? I wouldn’t let myself think that way or I would’ve thrown the book down on the ground and not finished it! Thank you! I have the ebook so I didn’t have any blank pages but that is so mean!! I would’ve been mad too! Oh my gosh! I didn’t know that about the ebook. Yeah I was definitely freaking out, but trying to stay in a state of disbelief until I finished the book.